Earth Networks markets weather data to numerous markets. For B2B companies targeting numerous vertical markets, creating strategies to reach varied customer segments can be a challenge, particularly on a limited budget. Connecting with disparate audiences is possible, if you think strategically, says Anuj Agrawal, CMO, Earth Networks, presented “Mixed Messages: How to Attack Vertical Markets With Horizontal Products” at B2B LeadsCon’s Connect to Convert. Earth Networks operates global weather networks and offers clients hyperlocal weather data they can use for planning, safety alerts and other purposes. It sells into numerous markets, including education, state and local governments, insurance companies, airports, sports stadiums and golf courses. Different verticals use the data in unique ways. Schools, for example, might create a classroom curriculum to teach K-12 students about weather science, while municipalities and sports facilities would use it to alert the public about severe weather impacting activities. Weather visualization products can help emergency systems managers keep track of upcoming storms, and input latitude and longitude criteria for what areas they’d like alerts about, as well as how often. While Earth Networks currently markets data primarily for safety and education purposes, it is looking at how weather data can impact analytics across commercial markets, such as retail. “That’s the next evolution,” Agrawal notes. Reaching such varied audiences, with varied needs, is a pain point for many B2B enterprises. Large companies with lavish marketing teams can create unique content for different verticals, but many businesses simply don’t have those resources. 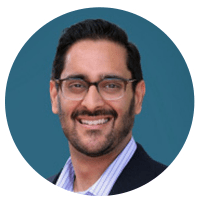 In his session, Agrawal will cover ways marketers on a budget can strategically target multiple audiences that have varied buying cycles, and ways to connect with them in different channels. He’ll also offer ideas for working with different vertical market resources, including industry trade associations.